What is a constructive community and how do they work? Classrooms are considered the training ground for young people destined to take their place in society as responsible citizens. The rules and responsibilities students are exposed to and engaged in socialise them into patterns of practice. This belief is founded on the socio-cultural theory of Russian psychologist Lev Vygotsky (1896-1934) – who asserted that children acquired the knowledge, skills and attitudes of their community through social interaction. Constructivist learning theorists, such as Jean Piaget, John Dewey and Maria Montessori, assert that children construct knowledge and develop understanding of the world around them through experience, and believe that students should be encouraged to reflect on their own learning and thinking, rather than being taught to recall facts or mimic processes without deeper understanding. Together, these two theories create a new approach to education, social-constructivist learning communities – classrooms where rules and responsibilities are learning-oriented, teachers and students work together as partners in learning, and patterns of practice are based on democratic ideals to prepare students for active citizenship. In these learning communities children actively participate in constructive learning experiences at their particular level of readiness and are encouraged to take responsibility for their learning and develop reflective thinking skills. In the learning community, the patterns of practice are modelled and supported by every member, as they work together towards their learning objectives. Teaching of the language, skills and processes required for full-participation and critical reflection is explicit. 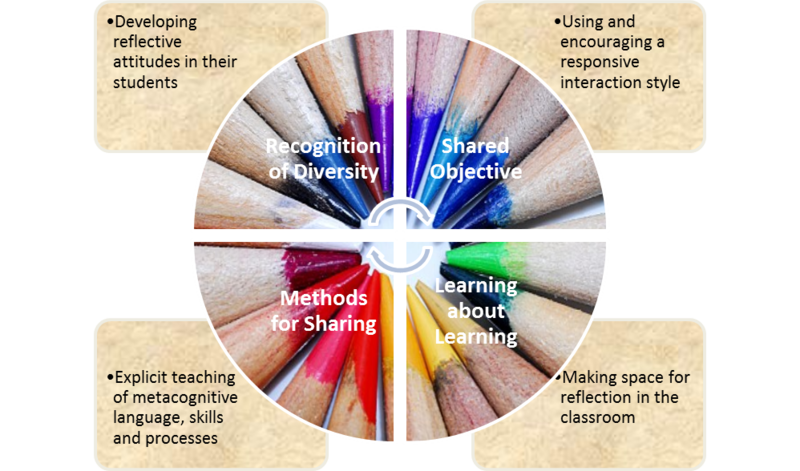 Time for discussion about the learning objective and the learning process is provided, so students can share their thinking with others, learn from others ideas, and develop understanding about their learning and about the learning of others. The role of the teacher in the constructive community is to model and guide student development of pro-social behaviour and constructive classroom conduct; as well as facilitating engaging learning projects, challenges, and scenarios for students to explore. Teachers are guided by their one core teaching and learning responsibility – to support learning. Teachers do this by respecting the agency of the learner, demonstrating respect, ensuring clarity about what is being learned, and maintain responsive reciprocal relationships with each student, work group and wider school team. 1. Developing reflective attitudes in their students – this is done by encouraging students to be open-minded to new ideas and the ideas of others, to take responsibility for their learning, and to take risks in order to learn from mistakes. 2. Explicit teaching of metacognitive language, skills and processes – this empowers students to take control of their learning and thinking and allows them to articulate their ideas in order to share them with others and engage in meaningful explanations and dialogues. 3. Making space for reflection in the classroom – providing time for students to think critically and reflectively about their knowledge, skills and attitudes. These reflections are also informative windows into the student learning process that is valuable for teacher understanding of student progress. 4. Using and encouraging a responsive interaction style – this is done by demonstrating commitment and respect for the learning relationships in the community, and by acknowledging and encouraging the learning that is occurring, as well as recognising and affirming student contributions to the development of the community. The role of the student in the constructive community is to be an active participant in learning, taking responsibility for their learning, collaborating with others and maintaining respectful and responsive relationships with other members of the learning community, both teachers and students. The constructive community model is an environment in which students can develop the patterns of practice required to become a socially responsible citizen. These learning-focused relationships are reciprocal and are infused with the concept of ako – or the acknowledgment that knowledge is: developed by incorporating each student’s unique strengths and prior knowledge; strengthened by shared experience; and that teacher and student interaction is a constructive force for both participants. This entry was posted in Uncategorized and tagged ako, learning community, philosophy of teaching & learning. Bookmark the permalink.